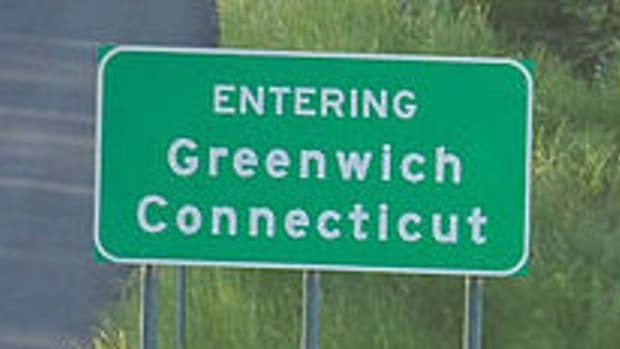 With its undisturbed views of Long Island Sound and a comfortable commute to Manhattan, Greenwich has long attracted men with brand-new money. A few months ago, one of the main pieces of the original Simmons estate changed hands yet again, this time for $18.5 million. The buyer&apos;s identity remains a mystery. Rumor in Greenwich has it he&apos;s either a Russian mobster or, more likely, a hedge-fund manager. The article, which points out that hedge funds occupy a third of the office space in Greenwich, goes on to drop the familiar names: Stevie (Cohen), Eddie (Lampert) and Paul (Tudor Jones III). But the most distressing information in the piece, aside from the fact that having millions of dollars just doesn&apos;t mean what it used to, is that most of the Greenwich money is--quel horror--new money. Today, what&apos;s left of blueblood Greenwich is nearly invisible. "Old Money est complétement disparu," one member of this dying breed confided to me, switching to French to make her well-bred point. Entre nous. "Or if they&apos;re not gone, they&apos;re in the woods, hiding." (Or else, like Leslie Lee, great-granddaughter of Zalmon Gilbert Simmons, they&apos;re living in what was once the caretaker&apos;s cottage on the family&apos;s former estate.) The people who count now in Greenwich, and everywhere else in America, it seems, are no longer Mrs. Astor&apos;s 400, but the Forbes Four Hundred. ** According to the DealBreaker editorial manual, Venn diagrams are self-evident demonstrations of fact(s).